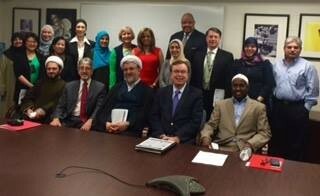 Muslim leaders meet with Interim Superintendent, Larry Bowers, and six members of his management team to discuss the survey implications of Muslim children facing various forms of bullying and anti-Muslim rhetoric and behavior. It was agreed by all that we need to work together in creating a safe learning environment for Muslim students. A series of recommendations was presented for identifying internal and external resources, setting the right tone from the top, measuring and responding to incidents of harassment/bullying, examining curriculum content and resources for bias and/or insensitivity, providing cultural competency training, sponsoring youth programs and hiring an advocate for Muslim residents. It was a very constructive meeting in which committed Muslim educators and leaders together with MCPS officials agreed to working together on a common mission. Pictured are those who lingered on after the meeting in energized conversations.